We’ve said that over and over again. Here at Bearing Arms, we have a whole category devoted to just that topic. Numerous people in the United States are alive today because they had a constitutionally protected right to keep and bear arms. While anti-gun zealots would seek to undermine this right, making it so countless people would die for lack of a firearm, all while pretending to make us safer, another country is going in a different direction. One country is making guns more accessible as a way to try and reduce violent crime. 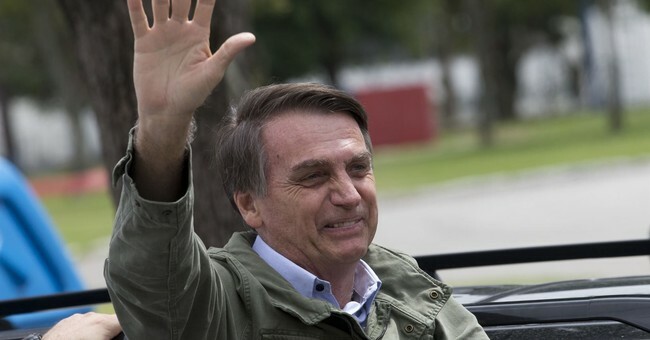 Brazil‘s far-right President Jair Bolsonaro decreed today the easing of national gun laws as part of his law-and-order agenda, despite fears it could aggravate already staggering violent crime. The executive order, signed in a live television broadcast, allows ‘good citizens’ to more easily own firearms, said Bolsonaro. ‘To guarantee the legitimate right of defence, as president I am using this weapon,’ he said, indicating the pen he then used to sign the decree. Brazil recorded nearly 64,000 homicides in 2017, making it one of the most dangerous countries in the world outside of a war zone. According to a survey published last month by the Datafolha polling firm, 61 percent of Brazilians are opposed to generalised gun ownership. His decree makes it much easier for adults with no criminal record to buy up to four guns and keep them at home. So, it’s not exactly the Second Amendment we’re talking about here, but it’s a start for the violent nation. Let’s face facts. Brazil has a population roughly two-thirds as large as the United States, yet it has more than three times the number of murders. Clearly, gun control isn’t working. There are those who fear that Bolsonaro’s proclamation will worsen the situation. That’s not too surprising. Brazil’s a country where the free ownership of firearms isn’t an everyday thing, so many will look at this with some concern. However, it would also behoove people to remember that the bad guys are killing plenty of Brazilians already. They didn’t need liberalized gun laws to create atrocities. But guns in the hands of law-abiding Brazilians can change the very nature of things in the South American nation. Now, criminals will have to start wondering if their next target is armed. Once they start seeing some of their fellow thugs dead in a gutter because they tangled with an armed, law-abiding individual, they’ll start to rethink their life choices. Or they’ll keep doing it and end up dead themselves. While people in Brazil are concerned, I’d like to invite them to remember that with the current laws on the books, crime has skyrocketed and become a major problem. It’s enough that it’s impacting the nation’s economy. It’s highly unlikely that good guys with guns could possibly make the situation any worse, so why not give it a try? Go and arm yourselves, good Brazilians, and be ready to defend yourself from attacks. Once the bad guys get the word, you won’t have to worry about much of anything.